ESA's Cluster was in the right place and time to make a shocking discovery. The four spacecraft encountered a shock wave that kept breaking and reforming – predicted only in theory. On 24 January 2001, Cluster’s spacecraft observed shock reformation in the Earth’s magnetosphere, predicted only in theory, over 20 years ago. Cluster provided the first opportunity ever to observe such an event, the details of which have been published in a paper on March, 9 this year. The shock wave that sits above the Earth’s surface is a natural phenomenon. It is located on the side facing the Sun, at approximately one quarter of the distance to the Moon, and is caused by the flow of electrically charged particles from the Sun. This flow of electrically charged particles known as solar wind is emitted in a gusty manner by the Sun. 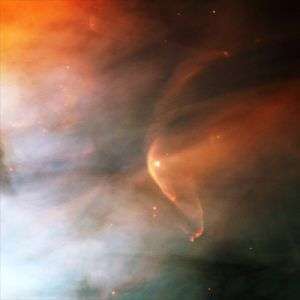 When it collides with the Earth’s magnetic field, it is abruptly slowed down and this causes a barrier of electrified gas, called the bow shock, to build up. It behaves in the same way as water being pushed out of the way by the front of a ship. On 24 January 2001, the four Cluster spacecraft were flying at an approximate altitude of 105 000 kilometres, in tetrahedron formation. Each spacecraft was separated from the others by a distance of about 600 kilometres. With such a distance between them, as they approached the bow shock, scientists expected that every spacecraft would record a similar signature of the passage through this region. Instead, the readings they got were highly contradictory. They showed large fluctuations in the magnetic and electric field surrounding each spacecraft. They also revealed marked variations in the number of solar wind protons that were reflected by the shock and streaming back to Sun. "The features derived from three different scientific experiments on the Cluster satellites provide the first convincing evidence in favour of the shock reformation model," says Vasili Lobzin of the Centre National de la Recherche Scientifique, Orléans, France, who headed this study. Vladimir Krasnoselskikh, also of the Centre National de la Recherche Scientifique, Orléans, France, who is a collaborator on this new research, had predicted the shock reformation model theoretically in 1985. It is a little similar to the way waves in the ocean build up and then break onto the shore, only to reform again, some way out to sea. The detection has implications for the way astronomers investigate larger bow shocks around distant celestial objects. Bow shocks are related to some of the most energetic events in the Universe. Exploding stars and strong stellar winds from young stars cause them. Reforming bow shocks can also accelerate particles to extremely high energies and throw them across space. Although the conditions that cause the reformation of a shock wave are rare around the Earth, they are common around these other celestial objects. "In astrophysical situations, the conditions needed for the bow shock to overturn and reform is almost always met," says Krasnoselskikh. The fact that Cluster has given scientists their first concrete data from such a bow shock reformation event is a valuable gift to space physicists. "This is a unique opportunity to study distant astrophysical objects in the kind of detail not available in any laboratory," says Krasnoselskikh. "Understanding the physics of shocks is essential for comprehending both complex astrophysical phenomena and accurately forecasts of the nearby space environment," says Philippe Escoubet, Cluster and Double Star project scientist at ESA. "Once again Cluster has demonstrated the need for formation flying with multiple spacecraft to augment our knowledge of shocks." The findings presented above appear in the paper, ‘Nonstationarity and reformation of high-Mach-number quasiperpendicular shocks: Cluster observations’, by V.V. Lobzin et al. published on 9 March 2007 in the Geophysical Research Letters.